That’s me, editing the Founders Grid newsletter. From Monday to Friday, I spend 4 to 5 hours each day curating the best resources, news and lessons shared covering tech, startups, business and design, and send 6–8 of the most interesting links out to my newsletter subscribers. Today I sent the 200th edition, and thought it would be fun to look back through the archives and compile a list of the articles which received the most engagement (in form of clicks) from the 600–800 or so resources I’ve curated and sent out over the past 100 editions. Learn how and why Skift abandoned their follow-on round of investment after deciding bootstrapping was a better way forward. Make sure you read how they did it towards the end of the post. Brian Chesky, co-founder of Airbnb, on not limiting your imagination to create ideas which can then be edited to provide the logic to make your ideas real. Great post. A great interview with Airbnb’s email specialist Lucas Chevillard covering what they are currently testing, email KPI’s and more. First Round have published a list of the 30 most “impactful, change-making pieces of advice” drawn from everything they published last year. A must read. From content marketing to Analytics to Facebook/Twitter marketing, this is a really well put together check-list for those working on sales and marketing right now. Co-founder Pascal Briod shares a great list of products he relies on to head up product at TawiPay. A must read guide from Unbounce for those involved with running Facebook ad campaigns. A couple of interesting extensions in this list I’ve not come across before. Worth a look. Great insights from Buffer on international salaries, effective tax rates and how they pay remote employees around the world. I wonder how many know about the advantages of remote working with a Hong Kong company. An interesting look at the new generation of workers in developing markets and the compounding growth at manufacturing costs from 2010. Forget the fancy offices and the free lunches — more than ever before skilled folks are understanding the true value of more freedom and less bureaucracy. Interesting SEO insights from BackLinkio after analyzing 1 million Google search results to answer the question: Which factors correlate with first page search engine rankings? A good list of 21 sales blogs and posts you should have on your radar. A great post on managing teams, getting rid of assholes, making tough decisions and not “putting up with someone because your afraid to lose their ability”. 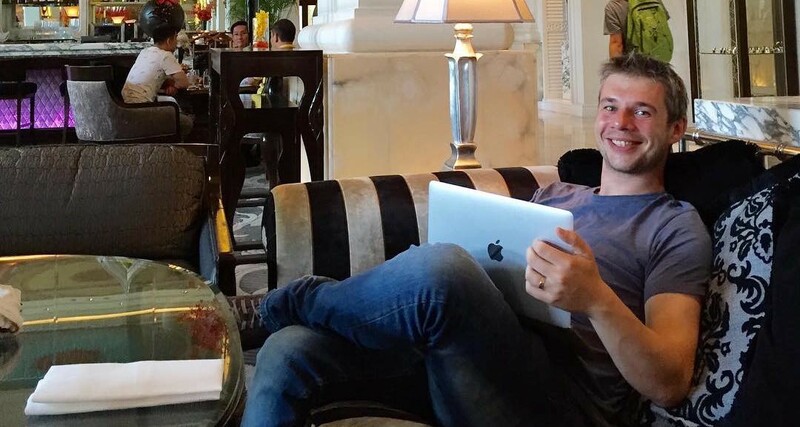 Noah Kagan of AppSumo fame lists every product he uses to run his business (and life). It’s a great list. Becoming a Real Startup — On Growing & Turning an Idea into Something Tangible, Fast. John Saddington shares the steps he has taken to research, launch and market his startup Tomo over the first 20 days. It’s a recommend read for new startup founders. A look at 14 interesting design projects as Github becomes an increasingly popular repository for designers to open-source their projects. Detailed look at how Benji Hyam used the google suggested search hack to massively grow search traffic over the past 6 months at ThinkApps. A good read from Mixpanel’s Content Marketing Manager, Justin Megahan, on how to improve your AB testing. Why you should do things well, whether you’re being creative or going travelling, a great read from ChopDawg founder, Joshua Davidson. From scaling slower to burning less, five useful startup tips with insightful commentary from Appcellerator co-founder, Jeff Haynie. NextView Ventures asked a group of founders to share their favorite interview questions when they build new startup teams. Some great questions here that are worth saving for later reference. A very useful look at product management tools from Songkick’s Dan Quine, including why Pirate Metrics is the best framework for startup metrics, the power of the 80:20 rule and looking for the aha moments in your product. If your interested in recieving a hand curated list of resources like these every day, consider signing up to my newsletter. A killer list of resources and advice for anyone interested in being a location independent entrepreneur, from books to read for building a business to sorting out work and travel visas. Enlightening article from the New York Times about a Finnish study comparing the effects different forms of exercise, such as weight training and long distance running, had on rats brain tissue. Hint: it might be time to start pounding the pavements. Involved with sales? Here’s a selection of 14 tools that can help you manage and close more sales leads. Great post from Flipboard co-founder and CEO Mike McCue on how to lead from first principles when everything is at stake and why they’re a bigger, more powerful force than anyone in the company, including the founders and CEO. Interview with Segment co-founder and CEO, Peter Reinhardt, on the build-versus-buy debate, recommendations on which tools to consider across eight distinct categories, the pitfalls to avoid when choosing tools and when to declare tools successful. A fascinating article and documentary about what happened when Kevin Roose asked two elite hackers to do their worse, from tracking down his social security number to getting access to his mobile phone account and finding his passwords. A look at key revenue milestones that K9 share with their portfolio, from $1K a month at the start of product-market fit, to $250–500K when scaling, along with advice to founders on how to reach them. Interesting look at the incredible success of Amazon Marketplace company Pharmapacks, thanks in no part to their development of proprietary algorithms, and a look at the general rise of companies selling through third-party marketplaces. Analysis published by consultancy LearnAirbnb claim that at least 75 U.S. hosts on the Internet home-sharing service are grossing more than $1 million in rental income a year. That’s $2,739 a day or $19, 230 a week. A great look at microinteractions (contained product moments that do one small task), why they work and are one of the best techniques for giving delightful feedback in app design. A great read about how language learning app Duolingo got 110 million users by using a task-based, gamified platform that helps users get up to speed on learning new languages. Peter Reinhardt, co-founder and CEO of Segment.io, shares some of the wisest words on finding product/market fit I’ve ever read. A must read. A salient reminder from Allen Gannett, CEO of TrackMaven, of the negative aspects of networking: drinking watery beer and eating supermarket cheese with other people who aren’t getting anything done, either. A fascinating read about Lydia Laurenson’s indoctrination into a very San Francisco secret society, complete with swipe card invitations and miniature libraries and populated by artists, that was actually run by a startup. Great post on how to approach Facebook advertising, with a look at tactics that work at scale, how they work or don’t work for earlier stage startups, and useful advice on how to leverage Facebook auto-optimization to what your bidding strategy should be. A very useful list of 39 sites with killer stock photos ready for to you use for nada. Getting six hours of sleep a night simply isn’t enough for you to be your most productive. In fact, it’s just as bad as not sleeping at all. A fascinating look at behavioral economics and the bad habits, human foibles, misjudgments and knee-jerk reactions that pretty much determine everything we think and do, from confirmation bias to hyperbolic discounting. A fascinating read on how Jen Dewalt quit her job to learn how to code by building 180 websites in 180 days, who is now going on to build a much larger company with both code and growth hacking skills she has learned. Fascinating look at Marketing Technology companies in 2016. With an infographic of nearly 4000 companies that’s a huge leap from the 150 featured in 2011, along with a very useful breakdown of the market. An interesting look at YC’s 60 startups this year, notable for including hardware, engineering, alternative energy and enterprise offerings, from smart oven, Tovala, to PetCube, a dropcam for Fido. A fascinating profile of Instagram’s first investor, Steve Anderson, who runs one of Silicon Valley’s most successful and smallest investment firms and likes to do things differently. A very useful post from Freckle founder Amy Hoy, on the five things she wish she’d known when starting in SaaS, from the fact that there is always another inflection point coming to focussing on your best customers 100% of the time. A fascinating interview with Chamath Palihapitiya, a Sri Lankan immigrant who escaped a civil war in his homeland before eventually landing a job at Facebook then starting one of the most formidable VC firms in the Valley. Great post from Mark Suster on the key questions you should be asking yourself before launching a startup, from knowing your potential market size and its structure to the strengths and weaknesses of the incumbents. Want to Create Things That Matter? Great article about how ignoring “shallow work” makes one appear lazy or distanced, but is actually the trait that enables great creatives to do work that matters. Fascinating Wired piece about how an anonymous whistleblower was able to spirit out and surreptitiously send journalists a gargantuan collection of files, which were then analyzed by more than 400 reporters in secret over more than a year before a coordinated effort to go public. Putting everything in one place helps you coordinate your life and accomplish the things that need to get done so you have more time for the passion projects that really matter to you. Here’s how you can start using project management apps for life management. Excellent piece on branding from Daehee Park, founder of Tuft & Needle — The mattress company that’s on track to do $225m/yr. Excited about the launch of Tofin, a series of experiments and explorations on what a browser could look like when its fundamental paradigms are invented in 2016 instead of 1996. One year in, Caroline Weaver’s tiny empire of Blackwings and Ticonderogas seems to be going strong. Who’s buying? An excellent guide with practical guidelines on designing better forms from UX designer Nick Babich. An excellent overview of launching a successful game on iOS from Amir Rajan, builder of ‘A Dark Room’, along with full financials and some great advice for aspiring indie app developers. What does Unsplash cost to run? A great breakdown of the services and costs associated with running one of the largest photography sites in the world. One of the best in-depth reports covering advertising on Facebook I’ve yet to come across. A must read for all those advertising on the Facebook platform. Great insights from Geoff Teehan — design director at Facebook, Alexander Mayes — product designer at Instagram, and more on what they find most challenging in their day to day roles. Kim Scott, an acclaimed coach for companies like Twitter and who has previous experience with Google and Apple, shares her experiences of leading teams into ideas you can use to help the people who work for you love their jobs and do great work. An interesting look at OpenAI, the artificial intelligence company launched by Elon Musk, founder of electric car maker Tesla, and Sam Altman, president of tech incubator Y Combinator. A brilliant, insightful and extensive piece from Sam Knight at the Guardian on how Uber conquered London. Wright has provided technical proof to back up his claim using coins known to be owned by Bitcoin’s creator. His admission ends years of speculation about who came up with the original ideas underlying the digital cash system. Also worth reading is Jon Matonis’s ‘How I Met Satoshi’. Ali Mese at Crew lays down some excellent advice for founders wanting to create side projects now that 62% of Crew’s revenue is generated from their own side projects. An interesting look at Uber’s data visualization team, who keep tabs on billions of GPS locations every day and millions of mobile events every minute. In China, savvy entrepreneurs are making millions a year by mining bitcoin. BBC’s Danny Vincent visited one of the world’s biggest facilities of its kind to film the activity and people within. UXPin’s visual guide to web design trends in 2016 is beautifully put together (no surprise there! ), and is a must read for all founders and designers alike. The Knight Cities Challenge just gave out $5 million to winning ideas from civic innovators to help 26 particular American cities, from Detroit to Macon, Georgia. Here are six of the 37 winning projects that other cities might want to steal. Great stats and comparisons of Micro SaaS, Bootstrapped SaaS and Funded SaaS startups from Clement Vouillon at Point Nine Capital. DAO (a company that needs no office, no employees, and no president) is ruled by a computer program. And they just raised $131 million…and counting. The Verge offers a great breakdown of the major highlights from Google’s I/O 2016 keynote including Android N, Google Daydream, Android Wear 2.0, Google Home (a competitor to Amazon’s Echo) and the new Allo and Duo (messaging) apps. Get your Credit Card ready as the team behind the excellent review site WireCutter have published a great guide to setting up the perfect home office. Jeff Bezos on experiments and failure: “If you think [the Fire Phone] was a big failure, we’re working on much bigger failures right now. And I am not kidding. Some of them are going to make the Fire Phone look like a tiny little blip”. Also worth reading is VC Fred Wilson’s take. According to Spotify’s annual report, the average employee, from receptionist to CEO, earns an average salary of €151,180, or $168,747 in current exchange rates. Interesting perspective from Steve Blank, creator of the “lean startup” movement, explaining how the role of venture capital has shifted over time, and why it doesn’t bode well for startup founders. A great insightful interview with Jon Lax, director of product design at Facebook, on where mobile and apps are headed. Musk believes that as AI continues to advance, humans will be left behind, and that even in the most banal situation, we’ll be treated like pets by artificial intelligence. From leveraging the Bullseye Framework to a list of 19 customer acquisition channels worth exploring, startup accelerator Dreamit shares this great guide to growth hacking and digital marketing aimed at seed stage startups. A great read on how shipping containers made the world smaller and how SaaS startup Flexport continues to streamline the complexity of international freight shipping. If you want to receive a diverse list of carefully curated tech/business/design news and resources sent to your inbox every day, sign up to the Founders Grid newsletter.